So to fix this locally, a nice setup for Ruby/Rails devs is Pow + Tunnels. Both are super-simple to setup. Pow is a local server, so if you usually run Rails on http://localhost:3000, you can one-click install Pow and all you need is to symlink your Rails folder to ~/.pow. Then you have a local server, sans port, like http://player.dev. Then, just install Tunnels and it will simply pipe https://player.dev into http://player.dev. Now you can open Chrome devtools’ resource tab and fish out any connections which are still https. Ideally host them locally, or at least change the links to https ones at possible loss of cache performance. Still, did you see various posts recently about ISPs injecting crapware script tags into people’s pages? OMG I know right! 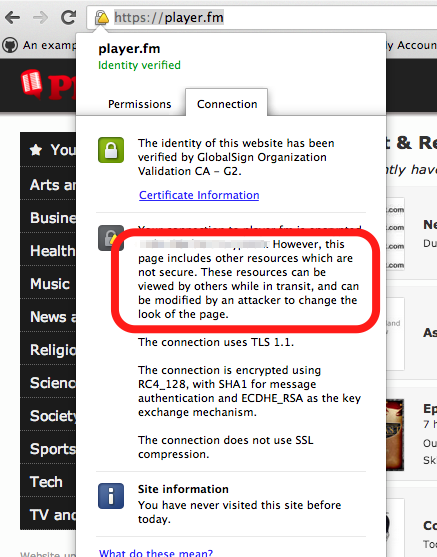 Seriously, https-everywhere is where the web is heading. Even public sites aren’t immune.